It’s been way too long since I posted a recipe, something I promise to remedy in the coming months. Starting today with a really simple, healthy one for a substantial soup. 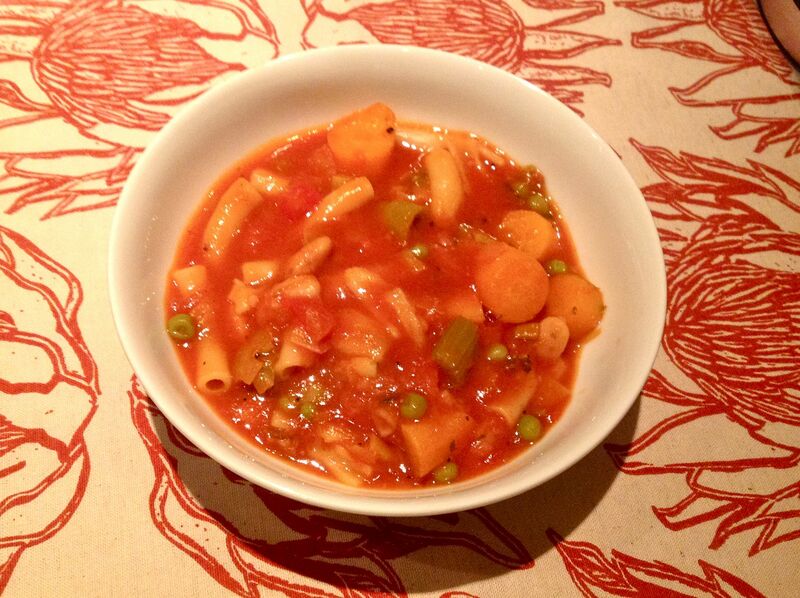 Minestrone is an easy way to get a good helping of vegetables into your diet. Use all your favourites and create a tailor-made bowl of goodness. For me the key is to get the tomato-richness right, which is why I’ve added a tin of chopped tomatoes and passata to my dish. And don’t forget the herbs. I used fresh thyme today as I have a big pot of it flourishing on my kitchen counter. I think oregano would also be great. This recipe is quick and easy to make, just make sure you don’t over cook the veg and pasta. It doesn’t take a lot of cooking. It also freezes well so make a big batch and you’ll have more dinners waiting for you. Heat the olive oil in a large saucepan. Fry the leeks, celery, carrots and thyme for 15 mins until softened. Add the drained beans, tomatoes and passata and stir well together. Add the stock and water and some black pepper. Bring to the boil and simmer for 2o mins. Add the macaroni and peas. Bring to the boil, turn down to a simmer, cover and simmer for another 20 mins. Keep an eye on the liquid content, you may need to add a little more water if you think it’s becoming too dry. But remember this is supposed to be a substantial, chunky soup.